Off-highway vehicle grant proposals are the topic of the Bureau of Land Management (BLM) open house on Tuesday, July 11, 2006 from 5:30 p.m. to 7:00 p.m. at the Barstow Field Office located at 2601 Barstow Road, Barstow, California. This meeting is to provide the public an opportunity to review and comment on off-highway vehicle grant proposals that will be submitted to the California State Parks, Off Highway Motor Vehicle Recreation Division for fiscal year 2007. BLM staff will present an overview of grant proposals and be available to answer questions. BLM applies for grants from the California Department of Parks and Recreation's Off Highway Vehicle Division each year to help fund and coordinate its off-highway vehicle (OHV) program. The grants support OHV management activities such as law enforcement, resource protection, planning and monitoring, visitor services, and maintenance on BLM and National Forest lands throughout the state. Copies of the individual field office applications also are available for review at BLM CDD offices in Barstow (760) 525-6000, El Centro (760) 337-4400, Moreno Valley (951) 697-5387, Needles (760) 326-7000, Palm Springs (760) 251-4800, Ridgecrest (760) 384-5442, and Sacramento (916) 978-4654. Written copies are available upon request by contacting the above offices. All grant applications will be posted on BLM's website at http://www.blm.gov/ca/pa/ohv/grants/2007/ by July 1. 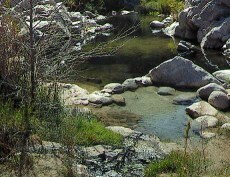 Information on the Grant process is available on the California State Parks' Off-Road Motorized Vehicle Recreation (OHMVR) website: http://www.ohv.parks.ca.gov/default.asp?page_id=1164. Comments may be submitted in writing to the Bureau of Land Management, Barstow Field Office, Attn: Mike Ahrens at 2601 Barstow Road, Barstow, California 92311, or E-mail to: Mike_Ahrens@ca.blm.gov. Only the public comments received by close-of-business July 21 will be forwarded to OHMVR Division as part of the grant packages. For more information contact Mike Ahrens, OHV Coordinator in the BLM Barstow Field Office at (760) 252-6047.